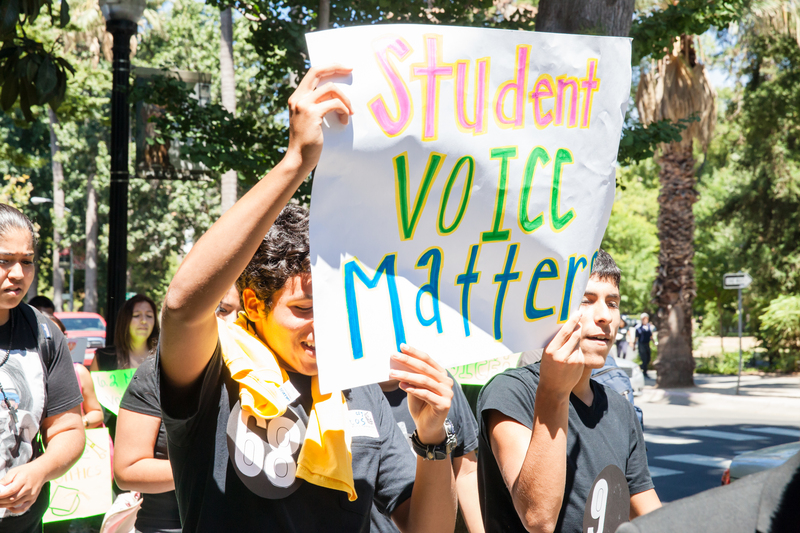 Californians for Justice launched the Student Voice Campaign in 2014 with one goal – for student voices to be heard, valued, and reflected in their schools. Our recent wins– from equitable school funding to more fair discipline policies have created an opportunity for great change in our schools. But before we can close the opportunity gap, we must close the ‘belief gap’. From the ‘Black Lives Matter’ movement to disproportionate suspensions of youth of color in our schools, to the lack of support for school staff, it is clear that we must take bold steps to ensure all students, regardless of race and zip code fulfill their potential. After winning student voice statewide, and in local school districts – giving youth a space to be heard in their schools – CFJ student leaders are already looking forward to the next step in achieving our vision for California schools – making sure student voices are valued. It’s not enough to be heard, or to just have a seat at the table. We have to build a culture in our schools that values students, especially low-income and students of color – as partners in education, and as valuable resources for knowledge and transformation. 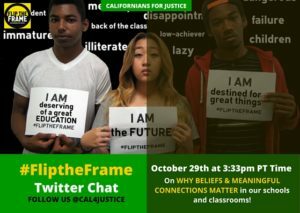 California is in the midst of a series of dramatic changes, with Common Core, the End of the Exit Exam, and 2015s low Smarter Balance Test Scores results, the state is under enormous pressure from youth and adults alike to make serious changes. CFJ student leaders are advocating for a new kind of education system that gives youth and their families a voice in molding a system that values all students. Youth envision schools that believe in the potential of all students, that have a culture of connections – building healthy and meaningful relationships between youth and staff and that empower youth and staff to lead change together. With our schools on the brink of a radical transformation, it’s up to us to make sure that the changes made value all students, and that invest in building school cultures where staff and students can thrive. This fall, students will be launching a brand new campaign – Growing Connections, Transforming Beliefs – aimed at improving school culture by fostering more meaningful relationships between students and school staff. The campaign will directly build from our 2014 successes, using the new avenues for Student Voice to implement policies and practices that transform the culture of our schools. Get involved in this next chapter of the student voice campaign by joining CFJ’s Twitter chat on why meaningful connections matter.